PC Gaming continues to grow annually as one of the primary platforms for gamers to enjoy their favorite titles. E-Sports (think MLB/NFL/NBA/NHL-level skills, commentary and viewership, but for video games) also continue to grow, creating a generation of hyper-competitive gamers all vying to rise above the rest. Throughout of the history of PC gaming, players have used a variety of voice communication programs to allow them to communicate with their teammates. 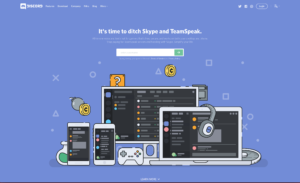 Skype, Mumble, Ventrilo, and Teamspeak are just a few of the clients that are still used today, but in late 2015, a new challenger appeared: Discord! You heard them. It’s time to ditch Skype and Teamspeak! Discord was created to serve as VoIP platform that can host many users at a time for voice, text, image and file sharing. It’s the perfect solution for users that were looking for a voice chat program that is easy to use, resource-light, and capable of just about anything. 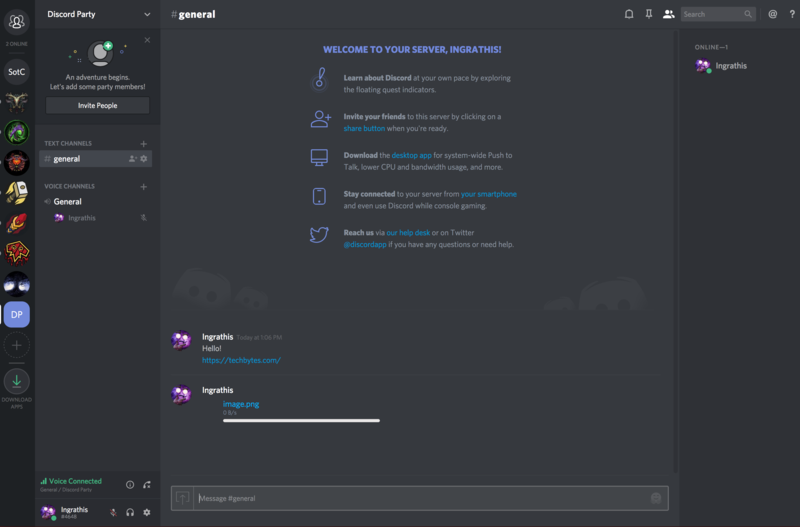 Here’s what Discord looks like once you’re logged in. In the center of the screen, users can use discord like they would any typical messenger program to send files, links, texts, images, videos, and other files. Slightly to the left, you can connect to channels to communicate with others over chat. Traveling even further to our left is a list of discord servers you can join. These are specific groups of channels that you usually have to be invited to and are usually filled with members of various online communities. It’s a great way to chat with people who share similar interests! Many subreddits and YouTube communities have dedicated discord servers. Discord’s popularity is exploding, with over 45 million users as of May 2017. It’s ability to provide services in an easy (and free!) to use platform that others have failed to match in the past makes it a strong contender for the best VoIP program to date. It even boasts fairly robust security features, such as having to confirm a login via email every time you try to log in to discord from a new IP address. To get started, head on over to https://discord.gg to sign up. 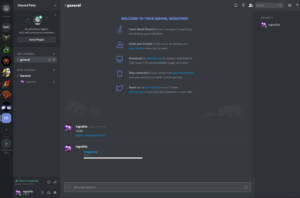 Discord is also available as a client application on desktop machines, as well as for mobile devices like iOS and Android. 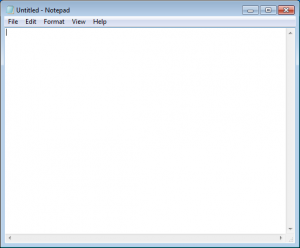 This entry was posted in Operating System on September 12, 2017 by dhand. 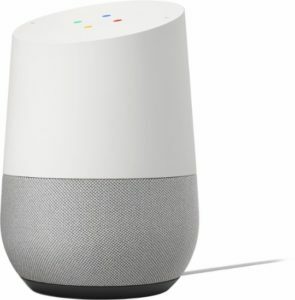 The internet is all over a story today involving burger giant Burger King and tech giant Google, in which Burger King released a new ad that takes advantage of Google Home, the in home personal assistant created by Google. This device mirrors other in home assistants like Amazon’s Alexa. However, in true internet fashion, those that wanted to have a little fun caught wind of this ad pretty quickly turned this innocent commercial into something a little more ridiculous. Asking Google Home the question “OK, Google: What is the Whopper burger?” gives the user a description based on the current Wikipedia article. This rule applies to anything that is searched for in this fashion. Users who wanted to mess around with the first line of the Wikipedia article started to edit the line, making it say things like that the Whopper’s main ingredient was cyanide, and that the Whopper was “cancer-causing”, which would then read out when someone tried to run the voice command. 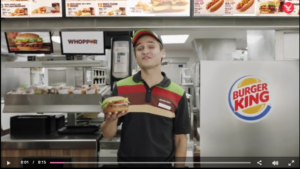 Within three hours, Google had modified their voice detection to not interact at all with the Burger King commercial. Users could still normally ask the device the same phrase, but it seemed that Google didn’t take too kindly to the small disturbance that this commercial was causing and shut it down as fast as it started. Stories of internet trolls taking advantage of AI programs are becoming more and more prevalent in recent years. In March of 2016, Twitter users were able to modify TAY.AI, Microsoft’s Twitter chatter bot, to make remarkably inflammatory and inappropriate comments. This entry was posted in Operating System on May 24, 2017 by dhand. Sometimes, it’s better to just forget! One of the most common tropes in the tech support world is the tried and true “have you tried turning it off and turning it back on again?”. Today, we’ll be examining how we can apply this thinking to helping solve common internet connectivity issues. While it’s one of the best things to do before trying other troubleshooting steps, “forgetting” your wireless network is not a step most people think to do right away. 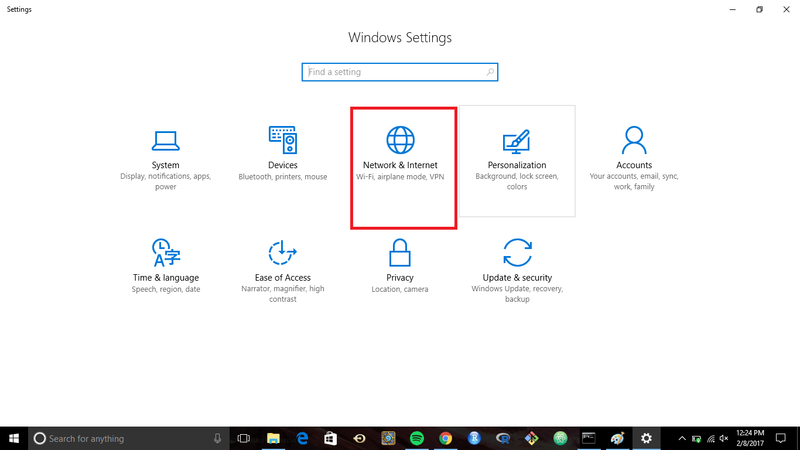 Forgetting a network removes any configuration settings from your computer and will cause it to longer try to automatically connect to it. 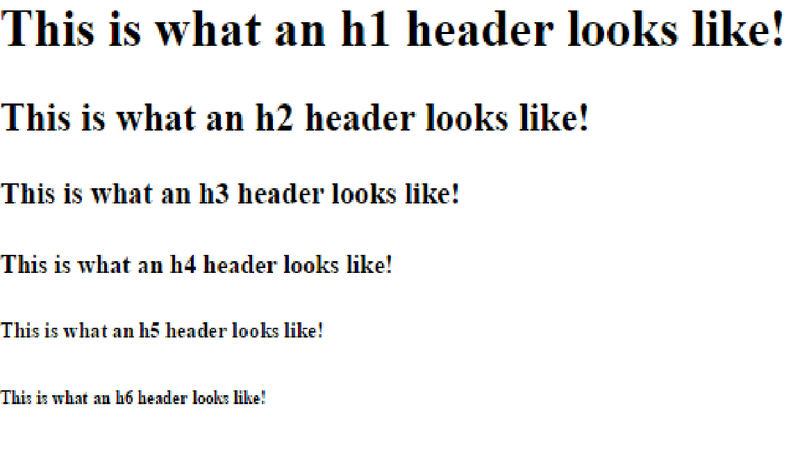 This is one way to try to fix configuration settings that just didn’t get it right the first time. 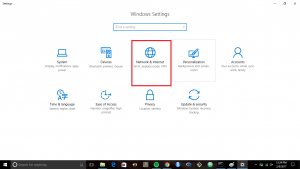 Today, we’ll be examining how to “forget” a network on Windows 10 in four quick, easy steps! 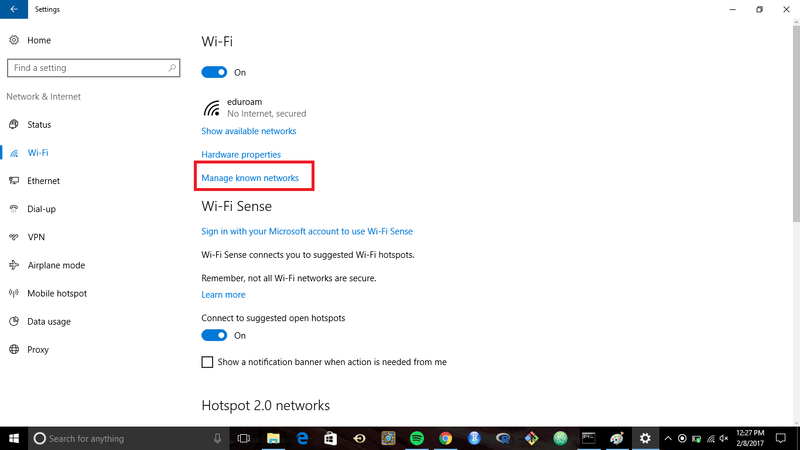 Select “Wifi” from the left menu, then select “Manage known networks”. 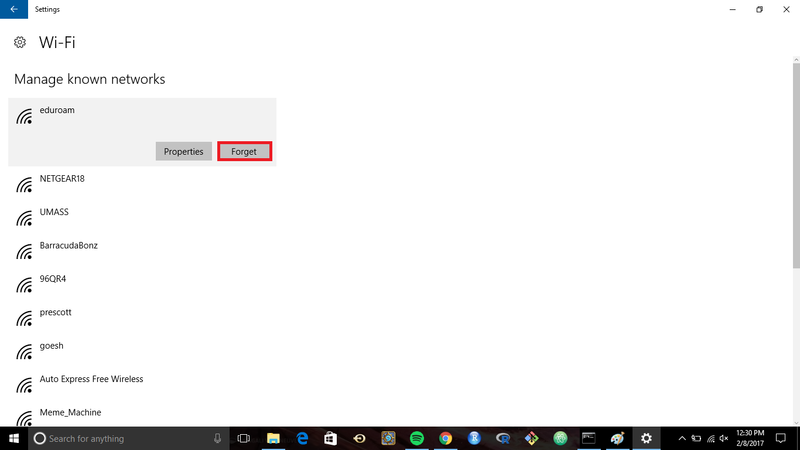 Find your network, click on it, then select the “Forget” button. Open up your available networks, and try to reconnect to the network you would usually connect. While this may not solve connectivity issues, it is a good place to start. 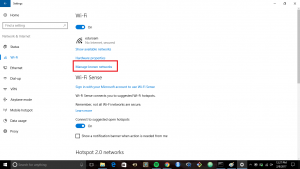 May this quick tutorial help you troubleshoot wireless problems you may have. If issues persist, you should next try to examine potential service outages, your network card, or, in the case of home networks, your modem/router. 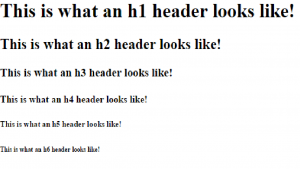 This entry was posted in Operating System on February 28, 2017 by dhand. Good at Pictionary? Try Quick, Draw!, from Google! It usually takes two (or more) players to play a game of Pictionary, or “guess what I drew”. Now, thanks to Google, it only takes one! Introducing Quick, Draw!, an A.I. experiment created by Google designed to teach itself how to recognize drawings and match them to words. 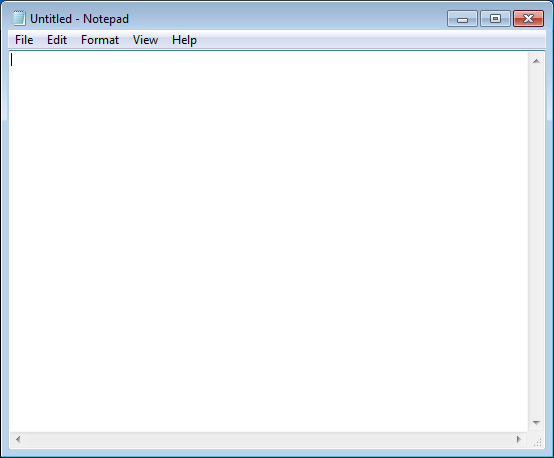 Today, I’ll be providing a very basic walk through on how the program works. If you saw the title and are just interested in learning about it yourself, skip to the bottom of this article for the link. This is the screen that appears right before it asks you to draw whatever it asks for. Here, it wants us to draw a bridge. You will then be asked, to the best of your ability, to create your best interpretation of a bridge. If the computer can recognize it, you’ll automatically move to the next one! From here, you can click on each picture to see what other people drew and what the computer recognized. Here we see that the AI was able to recognize the bridge, as well as showing what other words or items it may have thought you were drawing. Rainbow and fish were a couple of the other potential matches! Finally, if you scroll down, it will show you what other people drew that were successfully interpreted. As you draw, the Google AI uses a database of these pictures to try and help it identify what you are trying to draw. Naturally, the more pictures it has in it’s data bank, the “smarter” it will become, and the faster it will be able to detect what you are trying to draw. With some pictures, you can draw as little as two lines before it can tell what you are trying to draw! Neural network AI is a newer technology that is just starting to get its legs. Earlier this year, Tay.AI, a Twitter neural network bot created by Microsoft, was “taught” to be incredibly rude in less than 24 hours, thanks to user input. As time goes on and the technology improves, we will begin to see a whole variety of uses for this type of technology. It’ll only be a matter of time before the “Skynet” becomes a very real possibility. To get started with Quick, Draw!, head over to https://quickdraw.withgoogle.com/ to give it a try. This entry was posted in Operating System on December 8, 2016 by dhand.